Retailer-specific preorder bonuses for the North American release of Battlefield 3 have been revealed, with skins, dog tags and DLC all up for grabs. As you'd expect with a big release like Battlefield 3, the upcoming modern combat shooter from EA and DICE, there are preorder bonuses a-plenty for those willing to commit themselves to the game in advance. And as usual, what you get depends entirely on where you buy. If you snag your Battlefield 3 from GameStop, you'll get the Physical Warfare Pack, which includes access to some pretty impressive firepower and special ammo, and a copy of the Prima Battlefield 3 Strategy Guide for members of the PowerUp Rewards program. Pick it up at Best Buy and you'll get the SPECACT Kit, a collection of eight new multiplayer skins that will unlock when the game launches. And finally, if you order through Amazon you'll get an exclusive set of multiplayer dog tags. As we already know, all preorders, regardless of retailer, will be upgraded to the "Limited Edition" of the game, which will include the Back to Karkand DLC. And before you get too up in arms over the outrage of retailer-exclusive bonuses, bear in mind that the preorder goodies are timed exclusives, meaning that everybody will have access to everything as DLC at some point after the game comes out. 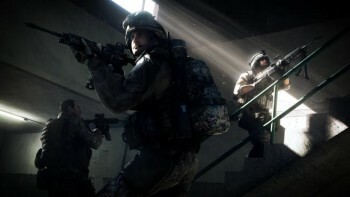 Battlefield 3 launches on October 25 for the PC, Xbox 360 and PlayStation 3. UPDATE: There's one more seller with a preorder bonus that's worth paying attention to and that'd be EA's very own Origin digital distribution platform. Gamers who preorder from Origin will get the Back to Karkand DLC, the Physical Warfare Pack, two exclusive Battlefield Play4Free items and early access to the Battlefield 3 open beta in September. Not a bad deal, and certainly not a bad way to turn a few eyes toward Origin.